Thank you for visiting our website! If you don't see what you want, just ask, we probably have it or can get it!. 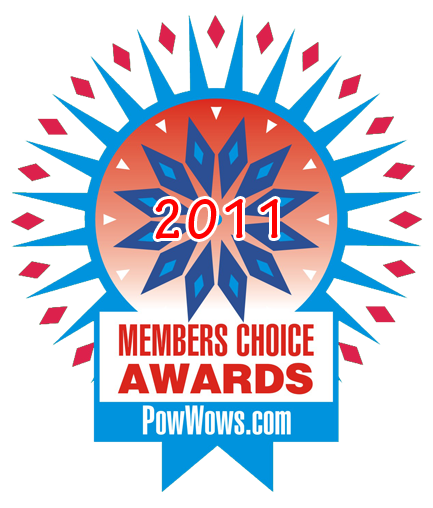 Member’s Choice Award Winner"Best Vendor"
We moved our store to Industrial Escondido! Be one of our friends! Our store is located off Interstate 15. 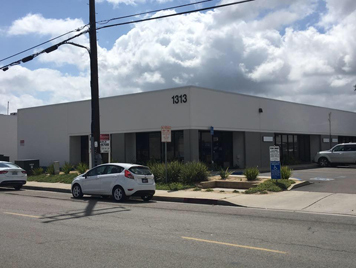 Location on Left after Fastenal. Elk teeth, cowrie shells and dentillium shells have been used for the decoration of traditional Native American women’s capes, dresses and other craft items from old times to the very modern present. In the old days it was a sign of wealth to have the top half of your dress covered with elk teeth. Only two “ivories” could be had from each elk hunted. As a result elk teeth were highly prized for their decorative value. Even today these elk “ivories” are very much in demand. Genuine elk teeth are like the “gold standard” of Native American craft items. Each year the price of a matched pair goes up and up, and they are not readily available. You have to be lucky to be at the right place at the right time to run into someone who is willing to sell or trade a pair of genuine elk teeth. Most hunters today, whether native or non-native, treasure the ivories for themselves or for their families.You might be surprised to know that the “imitation elk tooth” existed in the old days too! Examples of carved bone (imitation) elk teeth have been found on antique dresses and pieces of regalia.As a result of their scarcity, today there are several styles of PLASTIC, CARVED BONE and SIMULATED ELK TEETH available on the market. At any given Powwow you will see Native American women in beautiful traditional dresses adorned in these IMITATION ELK TEETH, and of course you still see dresses adorned in REAL ELK TEETH too! Dancing Bear is happy to supply a variety of “imitation” elk teeth for your craft use on dresses, ear rings, necklaces, hair ties, bandoliers, bags, breastplates, etc. The Money Cowrie was the shell used on old time Native American dresses. It has a yellow ochre color and is characterized by the dimpled bottom of the shell. One hole was drilled on the narrow top for attachment to dresses and other items. Long before European contact, these shells were an important trade item in North America which were brought inland from the Pacific coast by Native American traders. They were rare, and had a high trade value. Thus the name “Money” Cowrie. The Ring Top Cowrie is a modern import from Southeast Asia which has become very popular in the 20th Century through the present. It is characterized by an orangish line which “rings” the top of the shell. Thus the name “Ring Top”. They are a grayish on top with a cream-colored edge and underside. These are available exclusively through Dancing Bear Indian Trader. They are cut from ring top and money cowries to reveal the rich, purple color on the inside of the shell. These rounded discs, with a center hole like a sequin, can be stitched down in a line on buckskin like white clam shell hishi. The effect is amazing! The dentillium shell is another old time trade item of great value that made its way from the Pacific Northwest east to the interior of North America. It was the most prized of the trade shells. A dress with a full cape of dentillium shells was said to be worth several horses in trade. To complete her outfit, a woman might wear one or two pairs of long, multi-tiered dentillium earrings. Dentillium chokers were also worn by both men and women. On the Northern Plains, besides on dresses, dentillium shells were often stitched onto dress sleeves and hems in various patterns as decorative motifs. The old time dentillium has a smooth, shiny surface and is a golden color which can vary from whitish to cream to brownish. Unfortunately these old time shells are next to impossible to get. The ridged, white dentillium from Southeast Asia is the shell that has been readily available in recent years. It varies in length from ½” to 2” (premium size). It is fairly inexpensive, but select, long shells can be pricey. The drawback with ridged dentillium is that they are brittle and often break in pieces after they have been made into something. Recently a smooth, white, stronger dentillium has become available. It is also imported from Asia. It tends to be much longer on average than the ridged dentillium, and the price is not too high. There seems to be a resurgence of dentillium dress capes on the powwow circuit. Native American women are starting to use the smooth dentillium for dress capes as it makes up very nicely and does not cost too much. These are a recent import from India and are a great substitute for the difficult, if not impossible to get old time dentillium. They are much stronger than the ridged dentillium and tend to run long, most being 1-1/4” to 1-1/2” inches in length or more. Traditional ladies have been using them to make their beautiful dress capes. They work up quickly with stunning results. Dentillium Cape making tip: Sort the shells by length. Start with shorter shells around the neck. Gradually work up in size as you go so the outside rows have the longest shells. If you start with the longest shells at the neck, you will end up wasting a lot of shells. . Use a heavy cotton thread for sewing the shells as their sharp edges will cut thinner threads like Nymo or sewing threads. Use a double mercerized crochet thread (it won’t shrink) that is fairly thick. This thicker thread will hold up for a long time. We sell all of these above mentioned items. Press both Horse fabrics so that they are not creased. Use a paper plate as a palette, and small thin brush. Water down the acrylic so that it is a bit thinner than the original consistency (not dripping, think of it as an ink). You want to have it just right so that you can use the paint to soak in a bit. Practice on scrap material before using the Horse fabric. Cut the Red and Black Tipis in 4 long pieces 4.5” x 22” with a Rotary Cutter or Scissors, Pair the Red Tipis with the Black Horses and Black Tipis with the Beige Horses. Make sure to pay attention to the orientation of the designs.Pin one strip to the top and bottom of each piece of the horses FQs. Right sides together.Sew ¼” seam along the top and bottom of each horse fabric piece. Press the seams towards the center. 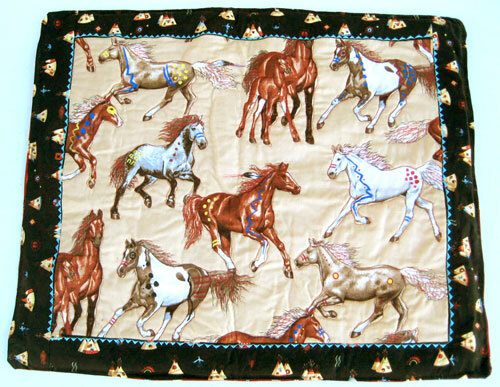 Pin strips to both sides of the horse fabric pieces.Pair the Red Tipis with the Black Horses and Black Tipis with the Beige Horses. There will be an extra amount on these lengths, make sure to allow for the selvage to be trimmed.Make sure to pay attention to the orientation of the designs. 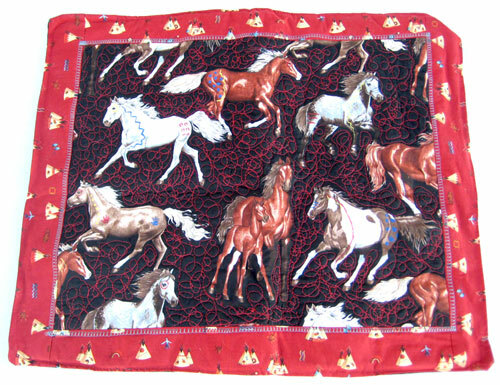 Sew ¼” seam along the sides of each horse fabric piece. Press the seams towards the center. You have your two pieces. Pin the seams down, and use a decorative stitch to go along the edge of the Tipi border of each piece, using a contrasting color for the thread. We used a decorative triangle stitch with turquoise colored embroidery thread. Cut a piece of batting for each completed mini horse quilt. Center horse fabric piece, with tipis on batting and use safety pins to attach in several places starting from the center and working out. About every 3”-4” place a pin. Outline horses with red thread. Circles in the background with red thread. If your machine has a free-motion feature, it works great for this design. Drop feed dog in sewing machine and stitch moving the fabric around with your hands outlining the horses, or making circles in the background. Variation:You can make 2 of each color and make a throw size blanket with these panels. They can be sewn together to make a pillow case, placemat, table runner. It’s really endless what you can do with them! To see more details, please visit our Native American fabrics page. We sell these items. Not all of them are on the website with shopping cart links. 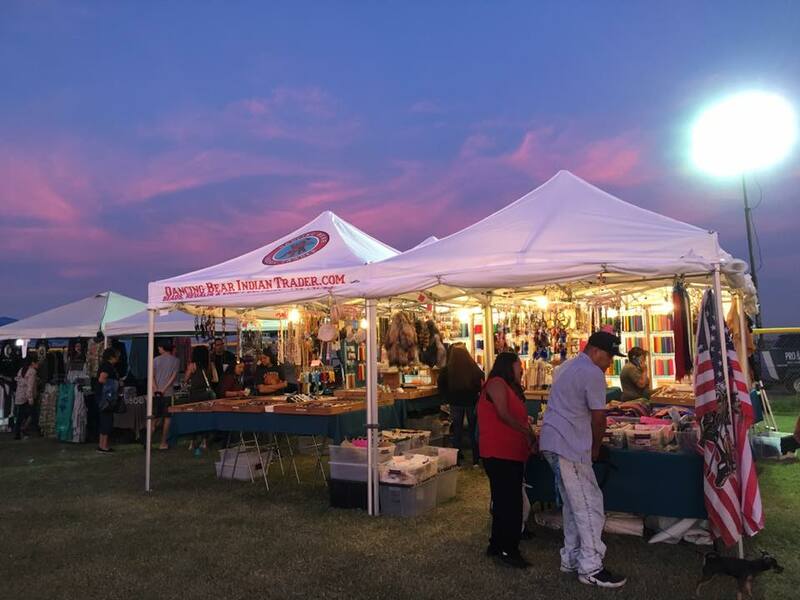 We have been working on the website as well as attending powwows and running business, please be patient with us, there is so much to put onto the website! We have a comprehensive collection of Native American craft supplies for any Native American project. We strive to find new items all the time. If you are looking for something and don't know where to get it, please ask us! We probably have it or can get for you! We hope you will be our customer, and that you think we are the #1 Indian Craft Supply, the go to, for your personal crafting needs!